The Defense Security Agency, a special intelligence service formed by the Myanmar military, continues to collect information related to civic activities, according to the organizing committee of the 22nd Honorable Ceremony for the late President of the Mon People’s Front (MPF). 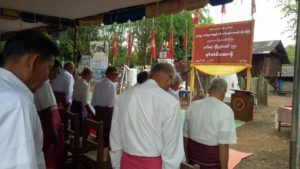 The 22nd Honorable Ceremony for the late President of the Mon People’s Front – MPF Nai Aung Tun – was organized by the Mon Literature and Culture Committee, Pa Nga Village, Thanbyuzayat Township, Mon State. The ceremony was held on April 29, 2018 in front of the Nai Aung Tun Statue at the Kyne Dee Pagoda in Pa Nga Village. “Two members of Sa Ya Pha (the Defense Security Agency) came to the ceremony. They’ve been making inquiries just like they did under the previous military government. They asked for the names of the high officials who joined the ceremony. And they also wanted to know which party they belonged to. They especially wanted to know who was from the New Mon State Party. They also recorded who gave the speech. They’re acting just like they have done in the past,” said Nai Thein Tun, the Joint Secretary of the Pa Nga Mon Literature and Culture Committee. Even though Myanmar has had two consecutive civilian governments, when organizing a public event or ceremony today it is still necessary to inform the Defense Security Agency about the event. “In our country today, it is like there are two governments. When organizing an event, we have to report to the General Administration Department – GAD. That’s all we have to do with the administrative body. But the military and the police also came themselves to collect information. If they (the military and the police) collect information in this way, civilians will be afraid. We can’t organize the event freely and we also don’t have freedom of expression,” said Nai Thein Tun. The Pa Nga Mon Literature and Culture Committee holds the Honorable Ceremony for the late President of the Mon People’s Front – MPF Nai Aung Tun – every April 29 and former members of the MPF are always invited to the ceremony. “In fact, they can get the information from us – the organizing committee. We’re ready to give them the information. This time, they asked us nothing but made inquiries and took photos at the event. It looked like they were trying to intimidate everyone there,” continued Nai Thein Tun. Officials from the New Mon State Party, the Mon National Party and Community Based Organizations from Thanbyuzayat Township, as well as former members of the Mon People’s Front, joined the ceremony. The President, Nai Aung Tun, passed away in Mawlamyine on April 29, 1970.